Now that was a nice day at Kahana. Two visiting pilots came out to fly with me: Bob from Bellingham and Pete Reagan (Jon's buddy) from Portland. It was a gorgeous day out there, although still a bit more east than we like, and after an hour deliberating on the LZ over the direction, me and Bob broke down and hiked to low launch. I launched first, and then top-landed to help Bob off. Then Pete showed up, and realized he had forgotten to bring his boots. I think he would have hiked barefoot, but after finding a shoe and a slipper on the beach he was able to hike and fly in style. I top-landed to help him set up and get launched. 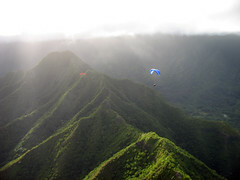 The three of us flew all over the ridge and the bay, enjoying the sweet strong conditions and the afternoon lighting. Suicide Pete showed up as we landed and worked on his kiting. It's been quite a while since I've enjoyed two days in a row at Kahana. Hey you guys, check out my pictures from today - I used my new camera on the superfine compression setting. Man that camera is fast, and the detail and lighting seem way improved over my old one. I'm starting to experiment with the zoom too. So much fun! awesome photo's!! i downloaded everyone. thanks again for the experience. i want more! Who needs boot anyway? I'll loan a pair of slippers to anyone who needs em. Them's good hiking. Nice pics Alex. I'm looking forward to you using that new zoom. You'r gonna like it. Sure was some nice lighting yesterday. I want some. Bob's my dad! You go! Those are some great pictures too. It looks like such an amazing area! But really, who needs shoes anyways?! They're over rated. As long as the experience was worth it you'll never remember what kinda shoes you wore! Fly fast, fly to the open!